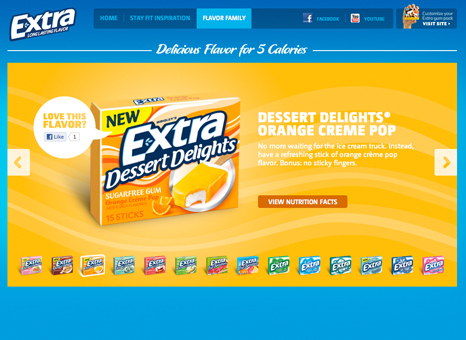 Extra Gum was entering 2012 with a refreshed campaign and they needed a new hub to go with it. 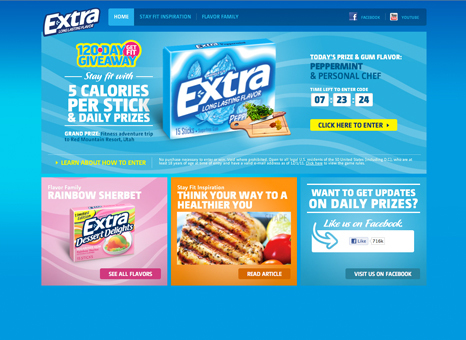 The website had to showcase the 120-Day Get Fit Giveaway promotion while also serving as the new home for the Extra Gum brand. 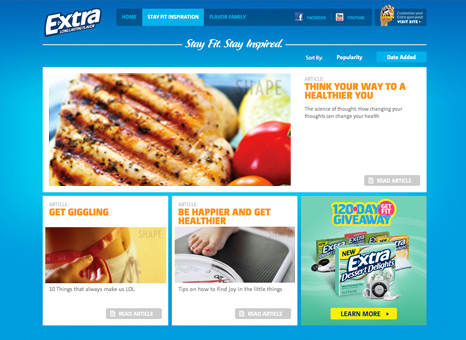 Extragum.com is a bright, organized hub where users can learn anything and everything about Extra. The 120-Day Get Fit Giveaway features fitness-related prizes and flavor pairings, demonstrating Extra Gum’s commitment to everyday fitness. Each day’s giveaway is showcased with a center stage image and a flavor pairing. Users can "Like" their favorites directly from the site. Created in HTML, the site is universally accessible. The experience continues on Facebook, where the brand gets fans excited about each prize with daily status updates and giveaways.